The past couple of weeks have pressed all of T’s mittens into use. In addition to the 3 pairs of plain stockinette knit mittens he has a store-bought pair that withstands the snow play longer. We asked, and looked but a Peace Fleece mitten is lost to the environment. He regrets the loss. Maybe someone stole it, Mom. No, I don’t think so but understand what you mean. It’s a pretty nice mitten except just one won’t help anyone. Since it really is a pretty nice mitten, and I do have more yarn, last night I cast-on & off again for a third one of these. The Peace Fleece yarn has all of my love & admiration as a kindergarten-mitten-grade wonder. It comes with some VM and stiff fibres for your picking-out but really does better than standing-up to this level of play. This morning, T regretted that the replacement is not as soft as the other. I was sure that he could break it in very soon. Early buds is my signal for there also being a lot of grit and mud left behind. 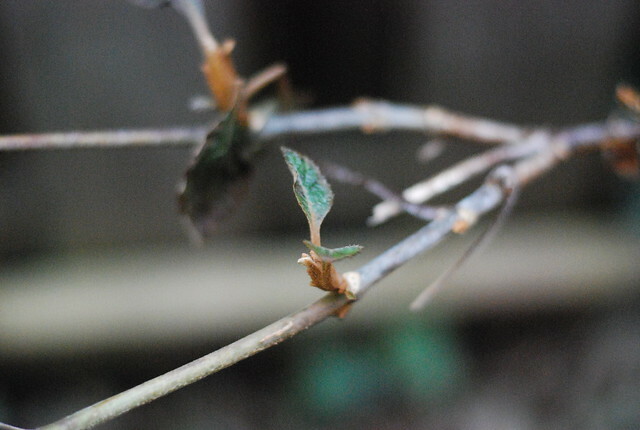 The school yard is making itself known with the accessories. We are at 15°C today, and may break a February record if the radio forecast is correct. It is downright delightful. 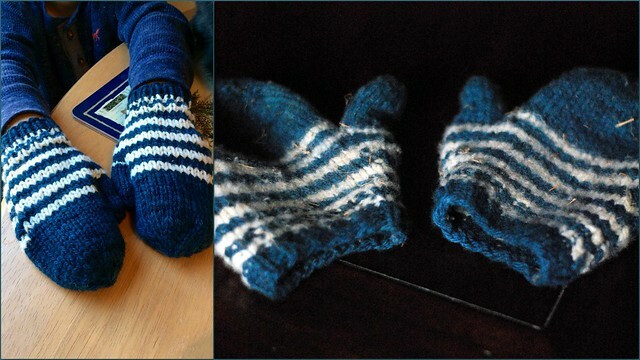 Remember the backup pair of Cormo mittens from Sheepspot yarn? They came in quite handy while I took my time working up to knitting the pattern a 7th time! Of the 3 pairs, it is the superwash Rowan wool mittens that has fared the worst under T’s outdoors fun conditions. Where the Cormo pair is this picture of fuzzed-out happiness, the superwash wool mittens have pilled, lost shape, and are close to getting rejected by T.
It’s all very well & good considering that I have some stranded mitten ambitions that could start with the child’s size! 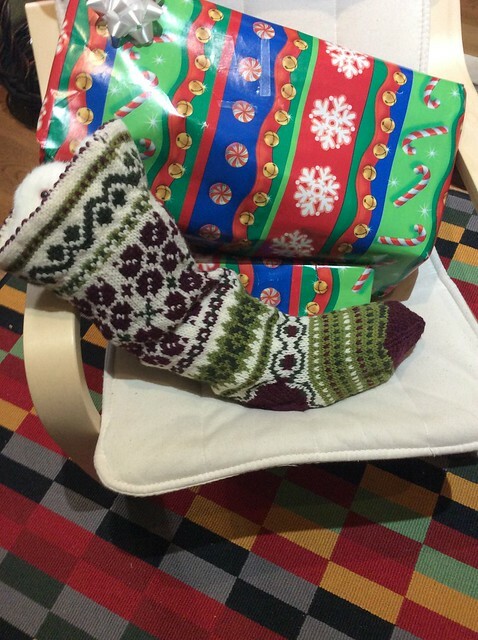 The Christmas stocking for T was a wonderful glimpse into Latvian motifs. 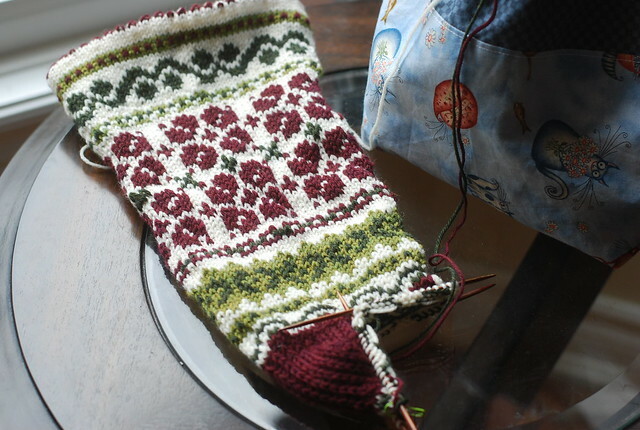 The pattern is “Irma’s Christmas Stocking” from the Fall 2011 issue of Knitting Traditions. After lots of delving, I replaced the 5th chart with a motif given as from Kurzeme in “Latvian Mittens” by Lizbeth Upitis. Specifically, chart 122, plate 13C in the book. This was my first time knitting with these now-discontinued yarns. 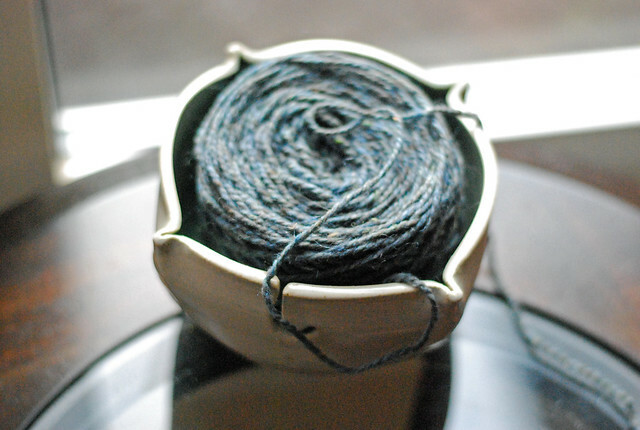 They are simply stunning for stranded knitting: Valley Yarns Northhampton sport. The other day, T got my warmest yes answer. He asked if we couldn’t just keep the stocking out a little longer. Why, I asked? Because I just like looking at it sometimes. Now if this is not a good reason to make warm mittens for growing hands then I do not know what is! Categories: Finished & in the wide world, Holidays Happen, Stash in; Stash out | Tags: Christmas stocking, Cormo wool, Flora, Mittens, stranded knitting | Permalink.